The Yellow Jacket is located in North America. Their genera is Vespurla Dolichovespula. It is yellow with black bands around the body and is ½ inches long. Warning: Yellow Jackets can bite and sting numerous times! Colonies are usually started with only inseminated queens overwintering. Colonies are protected in places as hollow logs, in stumps, under bark, in leaf litter, in soil cavities and human-made structures, but usually under ground. Queens emerge during the warm days of late April or early May, they select a nest site and build a small paper nest in which eggs are laid. After eggs hatch from the 30 to 50 cells, the queen feeds the young larvae for about 18 to 20 days. Cool fact: Try not to kill a colony because it will protect gardens by eating harmful bugs. Larva grow into fully groan adults in mid-June and become workers and colony defense. A worker is usually something that forages for food and is a defense system. Warning: Do not step on a rim of a wasp nest because you could be bitten and stung by hoards of wasps! Wasps die in winter because of the cold and the food is very scares. After a colony has disserted the nest will never be used again! And probably never seen again because it won’t be maintained and the winter will disintegrate it. Cool fact: When colonies get big the population expands rapidly, and depending on the species, may consist of as many as 5,000 workers and 15,000! 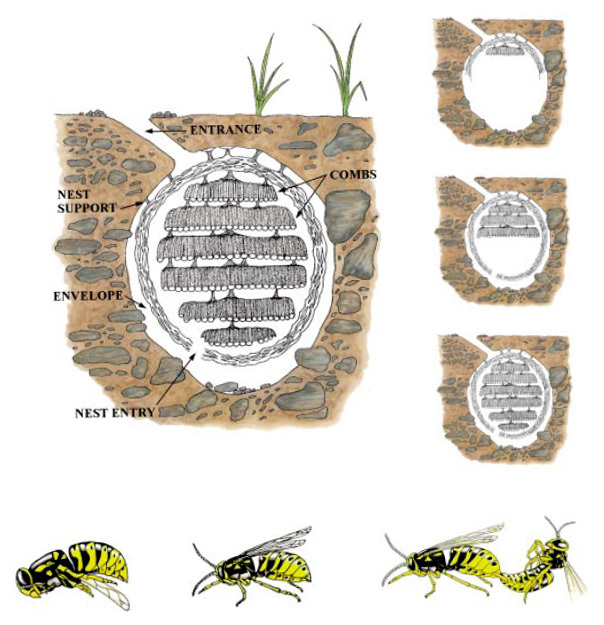 LIFE CYCLE OF YELLOWJACKET. Diagram of underground nest sections, above left. Queen begins building a new nest in spring, upper right. Nest expands rapidly in summer as the number of workers increases, middle right. In late summer-early fall, worker populations and the colony are at their peak, lower right. The colony begins to decline, and the deserted nest disintegrates rapidly in winter. Queen, lower left, in diapause position, overwinters under loose tree bark, roof shakes, or other protected location. Worker populations reach their peak in late summer, center (not drawn to scale, workers are 1/3 to 1/2 the size of queens). New males and queens mate, lower right; males die, and inseminated queens seek winter shelter. The cycle begins again in spring. Maximum size is attained in August or September. 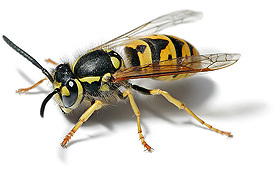 Cool fact: Yellow Jackets are the most aggressive wasp!! Warning: When a wasp is near don’t run or swat at it because fast movement will make it excited and attack you.